As a wife & mom, I often feel like I am always busy. In the free time I do have, I love to slow down and do something relaxing but purposeful. My favorite way to do that is by curling up on the couch with a hot cup of peppermint tea and an intriguing book that is relevant to the stage of life I am in. 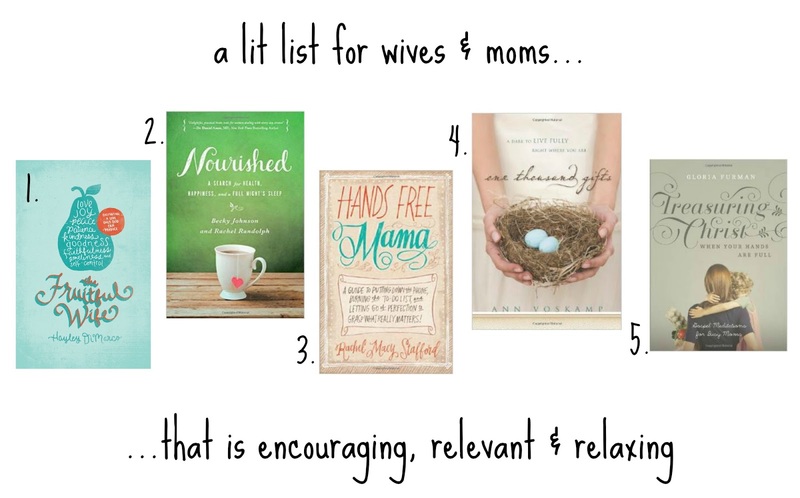 And while I haven't completely finished any of these books yet, they are all becoming my favorite reads for lazy afternoons while my little girl sleeps, so I wanted to share them with you in this month's Lit List for Wives & Moms. P.S. If you're still in search of what you want for Valentine's Day from a loved one, or you are looking for the perfect gift for a sister or friend, I would highly recommend any of these. 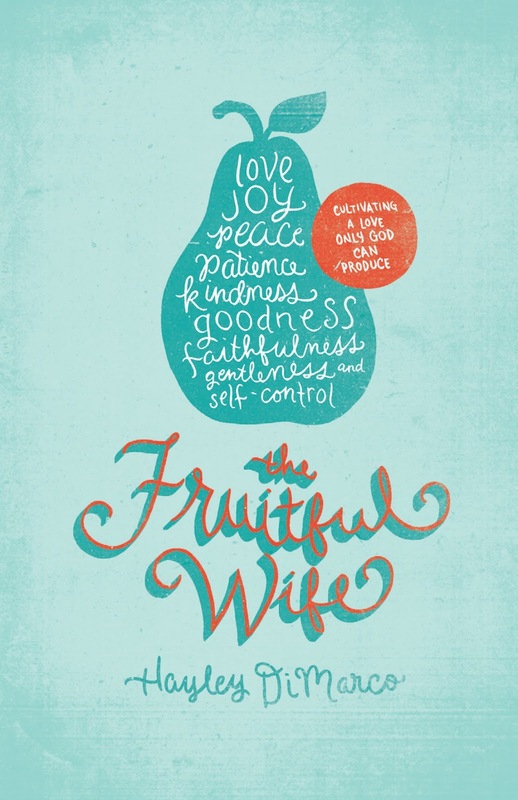 This book takes a look at how to be the woman God is calling you to be - a woman who bears the fruit of the Spirit in your marriage and daily life. The author explores the biblical significance of all nine fruits of the Spirit, explaining how each fruit first begins to grow and then how each impacts your day to day life. 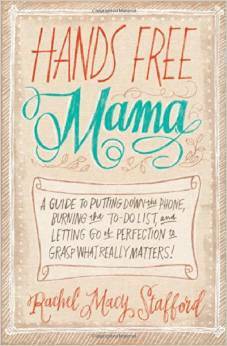 I've found it relevant not only in my marriage but also in motherhood and enjoy reading it on a daily basis. 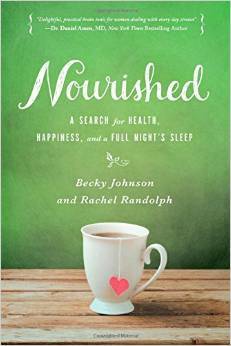 Written by a mother and daughter duo, Nourished looks at ten of the most common stressors that mess with a woman's mind - daily challenges that routinely steal her peace and joy. Together, they offer up a way to live a less depleted and more nourished life. "Opposites in many ways mom and daughter share their successes and failures as they make peace with their imperfect bodies, create living spaces they love, get wiser in their relationships, tame jam-packed schedules, settle into God’s love, and more. In short, they stumble and journey together toward a life that better nourishes them – body, mind, soul and spirit." I found this book after reading a moving article in the Huffington Post by Rachel Macy Stafford titled "The Day I Stopped Saying 'Hurry Up'" / Written by the same author, this book discusses how to find balance in a media-saturated, perfection-obsessed world with the goal of giving our loved ones the gift of undivided attention instead of constantly trying to conquer the to-do list. I am a very organized, Type A person and often find myself multitasking to the extreme. This book was one I bought with the hope of challenging myself to back off the lists and tasks, slow down and savor every day as a wife and mom. Apparently everyone I know had read this book before I did, but I was so intrigued to learn more that I picked it up and got sucked in immediately. Going along with the previous book which encourages being present, this book explores how to find joy in the "midst of deadlines, debt, drama, and daily duties" / It begs the questions 'What does Christ-life really look like when your days are long and sometimes dark and difficult?' 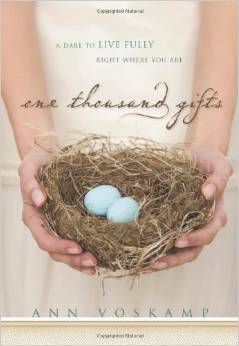 / Ann Voskamp invites you to embrace everyday blessings and embark on the transformative spiritual discipline of chronicling God's gifts. Being a person who tries to find joy in the little things and tiny moments every day, I knew this would be right up my alley. The title alone struck me and I knew this book would be so relevant to the season of life I am in. Even when I commit to reading the Word regularly, I often wish I was able to meditate more upon His word on a day to day basis in a way that connected with exactly what I was doing. 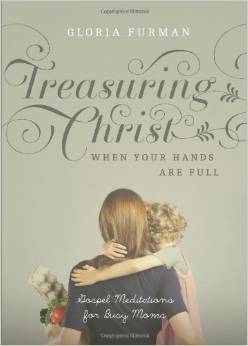 This is an encouraging book for moms which helps us reorient our vision of motherhood around what the Bible teaches, showing us how to pursue a vibrant relationship with God -- even when discouragement sets in -- and it will help you to treasure Christ more deeply no matter how busy you are! What books are you reading that have positively impacted your marriage & journey of motherhood? I love One Thousand Gifts.